Elin and Peter’s breathtakingly gorgeous kitchen remodel in their Del Ray rowhouse is all the more impressive for the fact that they did practically all of it themselves. They obtained the permits, construction plan, design drawings, and contractor licenses from their vendors. They researched and purchased all of the resources. Peter did all of the demolition and the heavy labor in general. They had hands-on help from one of Elin’s friends and worked side by side with a handyman, who essentially provided the tools and oversaw their work. The only work they contracted out was the plumbing, electrical, and HVAC. A glimpse of the stunning end result, before getting into the nitty gritty. Elin and Peter wanted an open plan and the kitchen space to be connected to the living area, as well as seamless in terms of style and color. They entertain a lot and wanted to prep and cook while socializing. They wanted bar seating in the kitchen, as well as a formal dining option. And they had one other unique requirement – they had purchased a large Italian plumbed-in espresso maker, had it shipped from Italy, and there it sat, in the box. 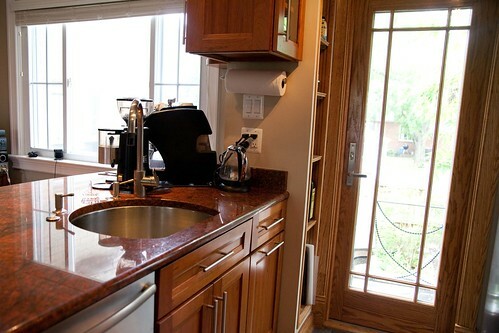 They made several major design decisions in order to accommodate the dimensions and plumbing requirements of the espresso machine. More on this later. Just take a look at the transformation they made. 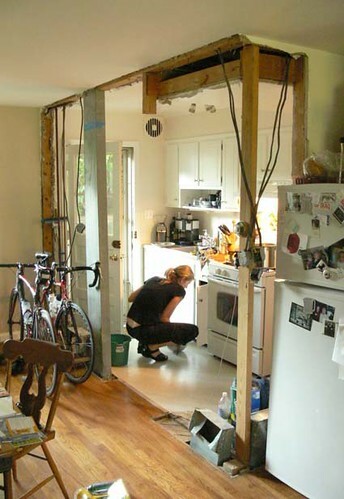 If we didn’t have photos showing the work in progress, you might not believe they started with this kitchen. Elin and Peter completely rethought the layout. 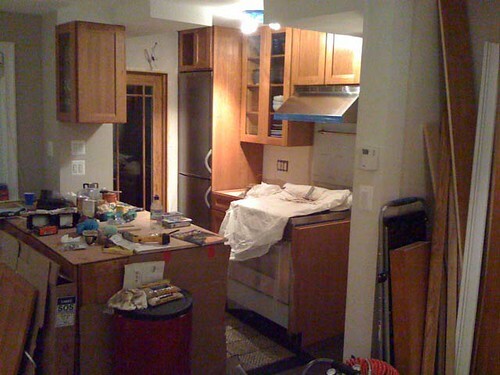 The only thing they kept was the existing refrigerator, which they moved to their basement. They also kept the floors in the main area, because the previous owners had refinished them nicely. A layout that is standard in these older rowhouses, the refrigerator and stove were so close to the basement door that you had to squeeze between them. The room was enclosed and the ductwork for the bathroom was housed in the middle wall. 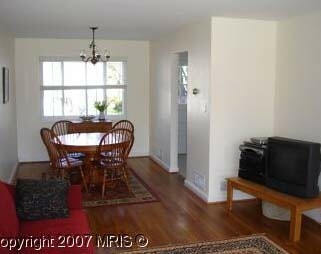 In this real estate photo, you can see the dining area and entry to the kitchen. They worked with Smoot Lumber for the construction side and initial layout. Next, they consulted with Lowe’s kitchen designer for the design elements – to show where the cabinets and appliances would be situated. 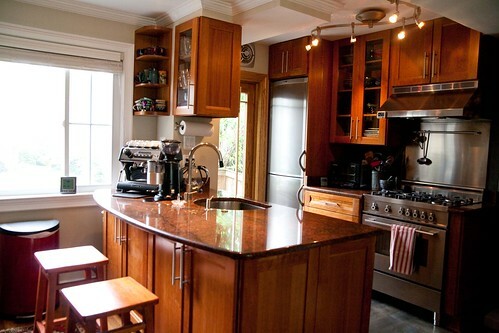 From the get-go, they realized that they’d need to plan their layout based on where their espresso machine would go. Since it would need to be plumbed in and it was so large, it made the most sense to make room for it on the peninsula and position the sink next to it. Everything else flowed from there. No way was that Italian espresso machine going to languish in the shipping box. And yet it did for almost a year, looming large as incentive to finish the renovation. Countertop. 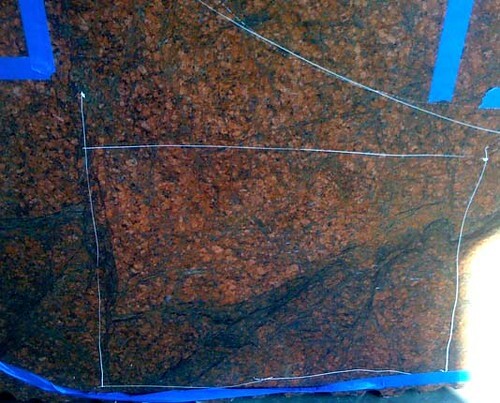 When they first started researching resources, Elin saw granite called “Red Dragon.” She based other design decisions on that color, in addition to the desire to keep the space open. They made price comparisons at a few places before buying a slab from Granite Discounters in Alexandria. They looked at several huge pieces of granite before choosing the singular piece they wanted. The vendor later lost the piece of granite they chose. Luckily, they discovered the error when they went back to double check on that portion of the project. They made them pull all the pieces out again with a forklift until they saw the piece Elin had marked up with chalk. Flooring. Morris Tile. Elin picked a tile made by Porcelanosa Grupo by Banos Top in the Ferroker Venis style. It had the look of poured concrete but is much dressier and variations in the colors pick up the color of the “Red Dragon” granite. They used the tile for the backsplash and wall tile as well. 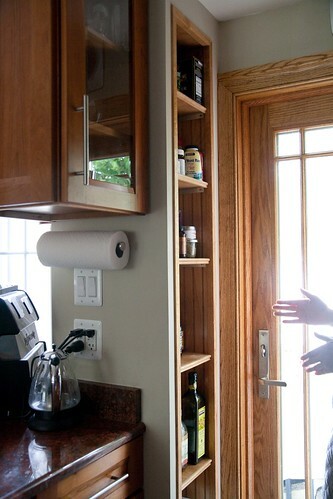 Cabinetry. Sonata Cherry Square with a Honey Spice finish from the Kraftmaid collection at Lowes. The line has beveled edges which gave them the finished, dressy look they wanted. The color matched the color of the wood floors as well. The floor color is “gunstock” over red oak. Elin and Peter matched that color with oak trim on the doors and the baseboards. Matching the colors made the kitchen and living area flow together seamlessly. They also bought a corner cabinet in the same line. Kraftmaid was the brand of choice for Elin and Peter because they carry non-standard sizes like 23 inches or 27 inches. Stove. A red 36” Bertazzoni stove stopped Elin and Peter in their tracks at a home expo center. Peter says it “made our collective hearts pound. It looked like a Ferrari, and as it turns out, was painted in Maranello at the Ferrari factory.” Ultimately, they felt the color would compete with the granite, so they ended up buying the stainless version. For the range hood, Peter found a vendor, AJ Madison on Long Island, NY, who cut them a deal on the price and shipping cost. Refrigerator. They chose an Equator Conserv refrigerator made in Denmark. 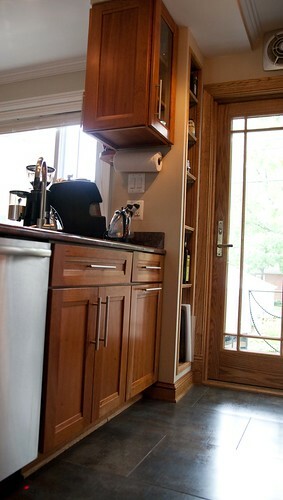 The perfect urban refigerator, it’s narrow, as wide as the counter, and tall (23.6″ wide, 23.4″ deep, 79.5″ high). 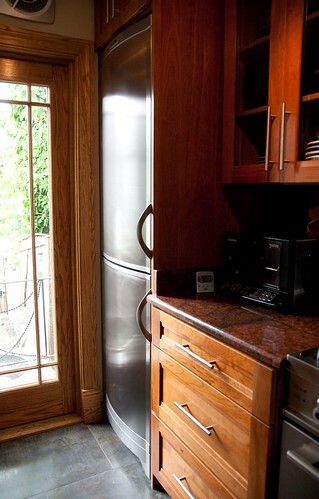 The freezer is on the bottom and has a dual compressor, which makes it more energy efficient and absolutely quiet. It was designed by David Whitfield Lewis, who creates the Bang & Olufsen stereos. Dishwasher. Bosch. So quiet, the machine projects a red laser dot on the floor to show when it’s running. They decided to install the full-size model since they do a lot of entertaining. Sink and Faucet. eBay. Elin wanted the widest sink she could fit in the space so she could wash big pans with ease. Their handyman tried to talk her out of it, but she persisted and they had to cut into the cabinet slightly on the supports to make it fit. Elin had bought the sink and faucet early in the process and they sat in the wings next to the espresso machine. Door. Home Depot. They found design details in the Anderson glass door that echoed the Art Nouveau/Arts & Crafts style of their antique cabinet in the dining area. They also chose a door with windows from floor to ceiling so they could frame a view of their shade garden and maple tree in back. Wood for column and crown molding. Smoot Lumber. By spending a lot of time with sales reps talking about the renovation, Elin and Peter were able to develop working relationships and were treated as contractors in their own right. They were able to secure better pricing deals for higher-quality materials and they learned a lot about all aspects of the project. 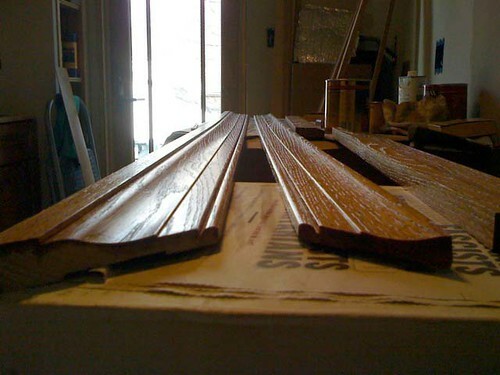 Smoots carried many different styles of crown molding in a variety of wood. They bought red oak and stained it to match the cherry cabinets. Glass recessed lighting and track lighting. Dominion and Alexandria Lighting respectively. They thought about using pendant lighting, but they thought the pendant lights would divide the room and they wanted to maintain a cohesive flow of space. Their electrician, Mark Snead from Multinet Corporation, recommended recessed lighting, wall washers to uplight the walls and artwork throughout the kitchen and dining room, making the spaces flow together. The recessed lighting is on dimmers, which adds atmosphere when dining. 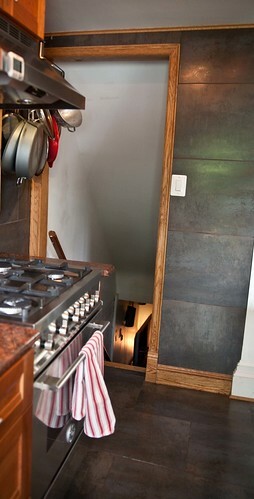 They used track lighting in the main section of the kitchen to control where the light bounces while cooking. I was impressed with the way Elin and Peter solved problems as they came up or used their combined creativity to come up with an ingenious design element. With the extra floor tiles, they first decided to use them as a backsplash, but instead of stopping halfway up the wall, they decided to buy more tiles and take it up around the door. The room looks more finished and sleek. You can’t resist running your hand down it. 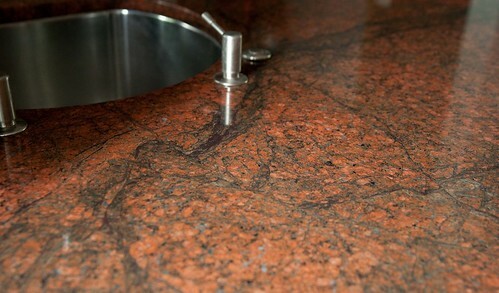 Elin found the exact designs she wanted to show on the countertop in the granite she found at the warehouse. She drew with chalk the exact cut she wanted and had the overall design drawn for the cutters to refer to. 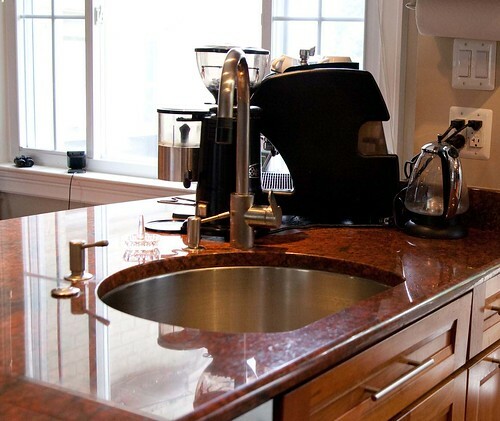 If you look at the countertop, you can see the lines she wanted to feature. As naturally occurring veins in the rock, they look like a river and its tributaries branching out. 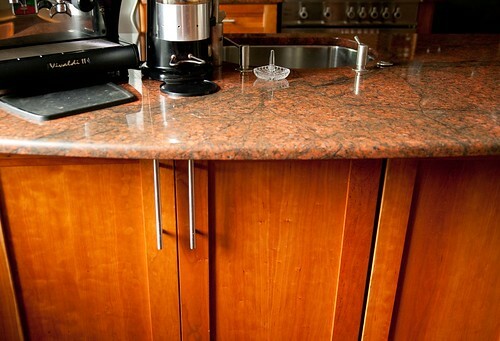 She also drew the countertop with a curve that has a slight bull-nose overhang. That way, it provides a pleasant eating space for one or two people. It makes the space feel organic and avoids having hard corners impede the main traffic area. Likewise, she and Peter wanted to mimic the curve of their Noguchi coffee table in the curve of the peninsula. Elin and Peter hired a contractor early on to help with some of the construction work on the wall adjacent to the basement door. 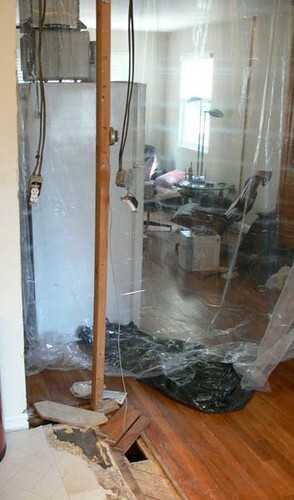 He used the wrong lumber size to frame in the electrical, which made the lumber flush with the drywall. 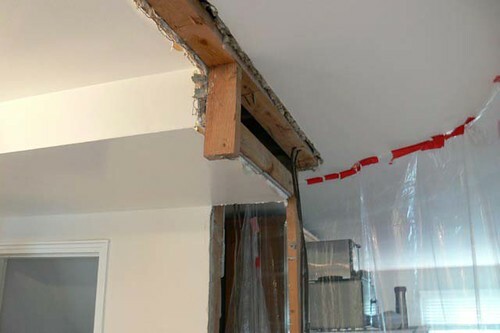 Instead of making him redo the job, they discussed the mistake amongst themselves, a process they undertook with every facet of the renovation. Elin’s friend suggested they conceal the mistake by having Peter build a column. As a result, the column makes the kitchen and living area distinct and is a beautiful architectural detail. 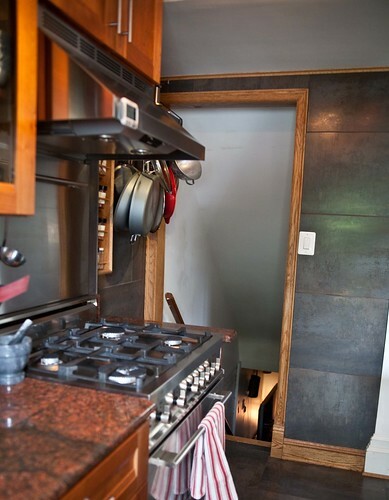 In the ceiling midway between the peninsula and the stove, there needs to be a place for the water pipes and air ducts for the bathroom above. You can’t get around this construction quirk. Elin and Peter decided to circle the incongruous box with crown molding. Peter and his friend installed the molding and Elin painted it. She says the used what’s now a lost art in crown molding workmanship, a technique called coping. 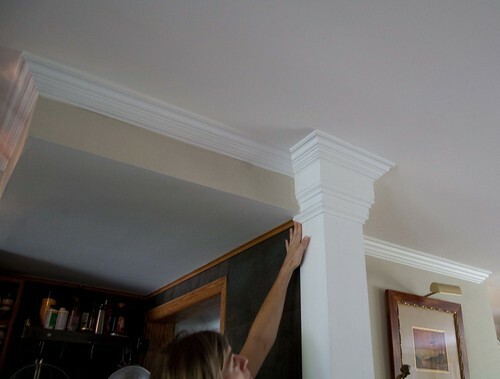 In many homes with crown molding, the joints separate from the humidity. Theirs won’t because they took the time to do it right. Their challenge with the molding was in dealing with the gradual settling of the plaster over time. 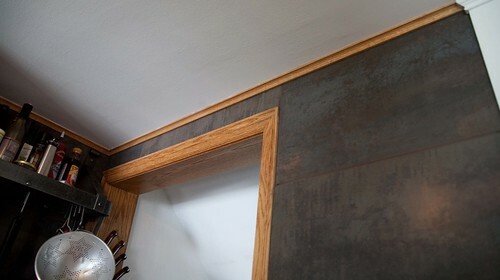 It is extremely difficult to get the molding straight and level. 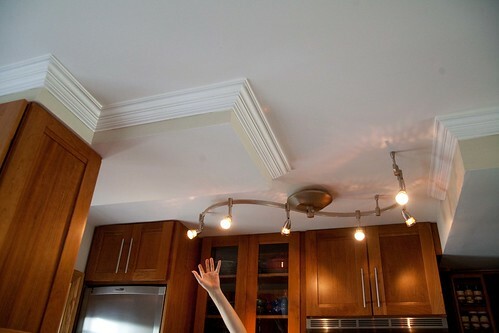 When they hung the cabinets, they had to do a lot of shimming as well. 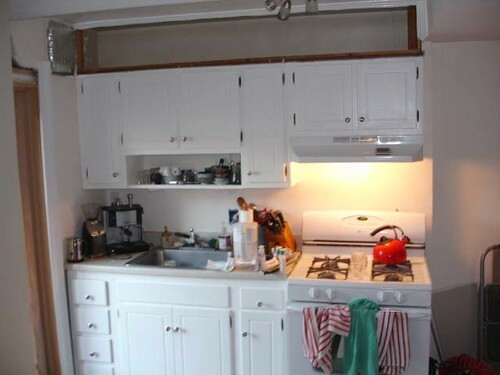 They had to hang the cabinets several times before they were happy with their “plumbness.” It took forever, Peter recalls, to get everything straight. During the demolition, Peter did a great deal of cutting to remove walls and sofits around the air ducts. He and Elin bought a Sawzell to cut through most portions of the wall. They used a cast iron blade to cut through old iron plumbing, a wood demolition blade, and wire cutters to get through the chicken wire inside the walls. The sofits had aluminum corner pieces that required a separate metal blade. Peter used three separate blades to cut each material cleanly. The homeowners who remodeled their bathroom from the same era can attest to the trials of getting back into those walls. During the construction process, they also acquired a lot of odd bits of wood. 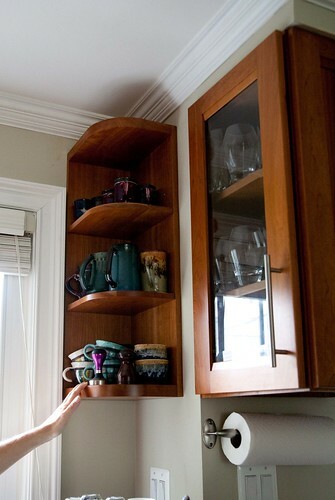 They used a leftover piece of cherry to make a spice rack and a piece of thin molding from the door to outline the spice cabinet. 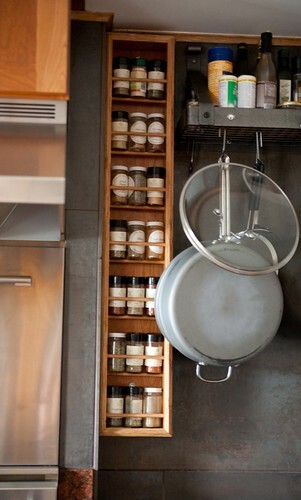 They made the spice cabinet with leftover pieces of wood as well. They only had to purchase thin wooden dowel rods to hold the spices. Elin and Peter chose a pass-through cabinet so they could display their glassware. 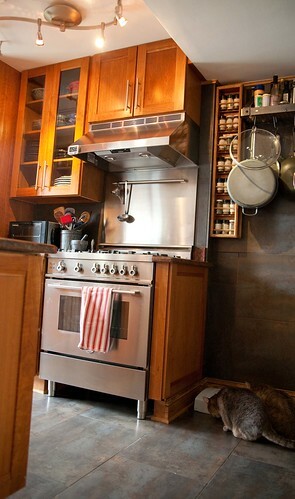 They also chose a beveled glass front on the cabinet between the stove and refrigerator to give a lighter feel. 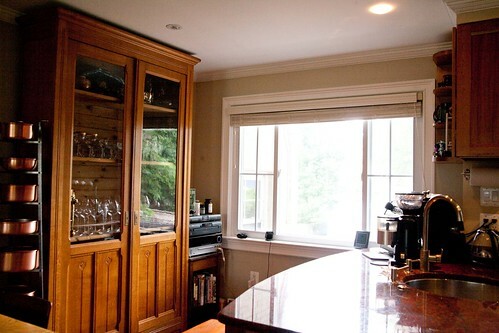 The beveled glass also echoes the glass in the antique cabinet on the far wall. 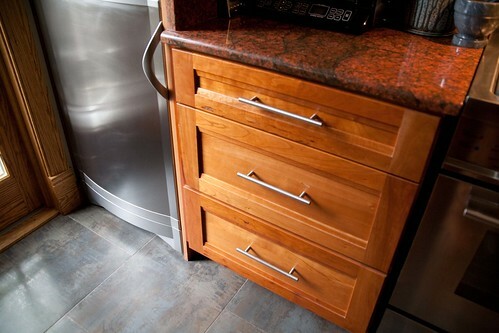 To make the refrigerator even quieter, they encased it in wood, which also made the room feel dressier. 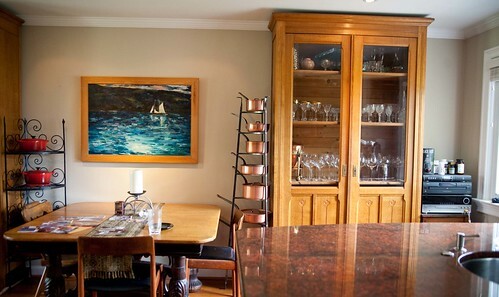 Peter says he likens the space to a “well-designed ship’s galley, with everything in its place and bright work where it makes sense.” They chose the drawers that close softly for the same reason, to make the room quieter. 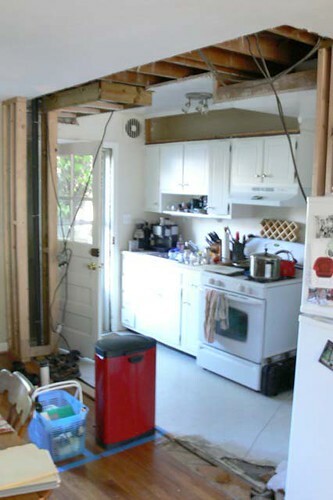 Maybe the most ingenious solution is what they did with the gap in the wall next to the door, from where the plumbing and ductwork had been moved. They worked a shelf back into the space to give more storage area. 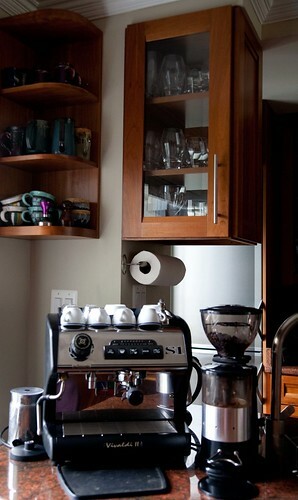 Another shelf is tucked on the opposite end under the peninsula, where they keep their espresso-making paraphernalia. 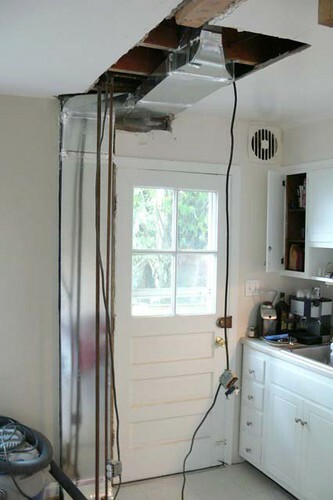 They ran into many snags along the way as a result of dealing with the characteristics of a house built in the 1950s by cheap general contractors, such as metal door jambs, uneven floors, odd electrical issues, and challenging wall materials. They took their time weighing their options at every stage, stepping back and assessing carefully the best way to proceed. They did a lot of online research, visited stores, made phone calls, asked opinions, checked notes, visited the same stores again. They had to return the cabinets because some of the doors were warped. They also changed their minds about using glass on the doors. They both had their professional careers to devote time to. Peter worked on video projects and editing in the evening and did the renovation work during the day. Elin worked on producing events and conferences. Was It Worth the Blood, Sweat, and Tears? There’s no denying that Elin and Peter achieved their goal of making the room flow and feel cohesive – warm, elegant, and spacious — while staying true to a shared artistic vision. 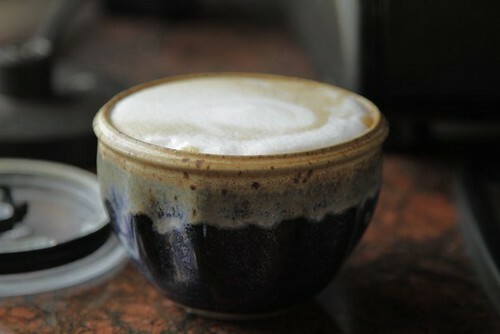 Which includes how to make the perfect cup of espresso for his wife every morning. Wow…I’m inspired. Thanks for all the detail!